Produced by the Royal Australian Mint in coalition with Australia Zoo, established by world-renowned conservationist, the late Steve Irwin, this sparkling new Australian legal release will enhance any world crown collection. Distinguished by a striking design upon its broad 40mm diameter flan, this dramatic .999 fine silver Frosted Uncirculated coin portrays ‘Bindi’ – a resident of Australia Zoo and Steve Irwin’s favourite crocodile, named after his daughter. 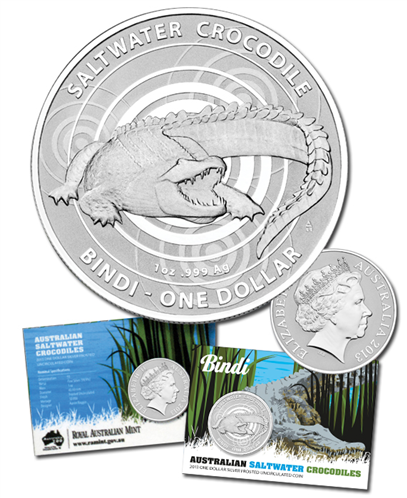 An official Australian legal tender issue, crafted from a troy ounce of pure .999 silver, the Uncirculated 2013 $1 Bindi Saltwater Crocodile is strictly limited to a worldwide mintage of just 10,000 – each presented in an official Royal Australian Mint pack.